The helmet is a safety headgear normally used for riding motorcycles, for industrial purposes in construction sites and in sports like cricket and for other purposes. They are all made out of synthetic materials. The world is increasingly moving towards finding a replacement for synthetic material that is eco-friendly to reduce the impact on the environment globally. 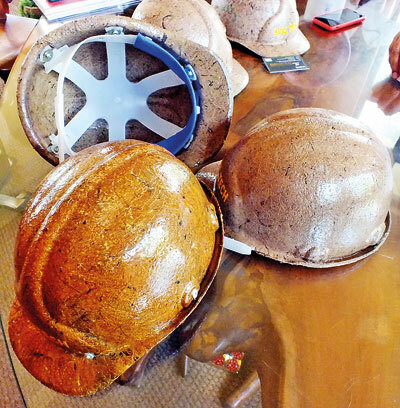 In this regard, a Sri Lankan company, Soil Tech (Pvt) Ltd at 352 Rajagiriya Road, Rajagiriya has invented an award-winning helmet made out of rubberized coir for industrial use, especially in construction sites and has patented the product. The product is not only durable but cheap. Soil Tech consisting of geo, bio and environmental engineers is core specialists in ground water exploration, horizontal directional drilling, geo-technical investigation, earth retaining structures, sub-soil improvement, landslide remediation and sports fields. They have been in the field for the last 20 years and completed many large and small projects ranging from Rs. 5 million to Rs. 500 million. The National Science Foundation (NSF) recognising the importance of promoting eco-friendly products in the local and global market commenced funding this project in 2014. Ms. Nadeeja Wicramaarachchi, NSF Senior Scientific Officer accompanied the Business Times (BT) last week to Soil Tech’s Rajagiriya office where everything is as close to nature, wood, plants, coil mats and the visitors were treated with a piece of ‘Kitul’ jaggary and a cup of plain tea to go with it. A ‘round-table’ discussion to provide details to the BT on how this innovative product evolved was held headed by C.J. Gamage – Managing Director and with Pradeep Ariyaratne – Mechanical Engineer, Ms. Gayathri Hiranya – Material Scientist and Ms. N. Kavya. Mr. Gamage explained that the main material used to make the helmet is coconut coir fibre mixed with rubber latex as a binding agent to ensure plasticity, water résistance and high impact strength and in a round mold, pressed through hydraulic pressuring system by giving known pressure and temperature. The final product comes in the colours of yellow, red, green and white. “This eco-friendly, light weight safety helmet could replace the currently used plastic once,” said Ms.Hiranya and said that coir used as the base meets the required international standards. Mr. Ariyaratne said that this coir helmet protects against impacts from, falling objects or debris, electrical shocks and burns and penetration and flammability and said that a performance test was carried out at the University of Moratuwa. It is produced according to ISO 3873-1977. Mr. Gamage said that imported plastic helmets are available in the market at varying prices up to Rs. 12,000, but their product could be sold at the range of Rs. 1,500. Manufacturing has already started and is now moving in the market and he said that there is heavy potential in the export market. Already there are inquiries from countries like Japan, Laos, and Singapore and even from the US, Mr. Gamage indicated. Ms. Wickramaarachchi from NSF indicated that they have decided to fund this project as it is important to promote nature friendly products which have the potential to replace the plastic helmets. The NSF says that helmets are used everywhere in the world mainly for safety purposes. Eco-friendly helmets can be a good competitor for plastic helmets due to its special technical properties as well as economical advantage .